Bustling, bold and beautiful Barcelona is possessed of an abundance of culture, art and atmosphere. This Catalan capital nestled in the northeast of Spain on the Mediterranean coast, with the ocean on one side and mountains on the other, is the country’s most popular destination and a great choice for a fun-filled family vacation. Here are my picks for fun things for families to do in this spectacular Spanish city. Castell de Montjuïc – Take the funicular to the top of Barcelona’s mountain, Montjuïc,to the Castell de Montjuïc. This former fortress was built at the end of the 18th century and served as a military prison until it was handed over to the city in 1960. Restored for the 1992 Olympic Games, many parts of Castell de Montjuïc are now opened to the public. It also houses the Museum Militar (military museum) and several new gardens, including a botanic garden with more than 2000 different plants and one with hundreds different types of cacti. Font Magica de Montjuïc – Situated at the foot of the steps of the Museu Nacional d’Art de Catalunya,the Font Magica de Montjuïc is a rousing spectacle of dancing sprays of water and floodlights set to classical music. The fountains magic only works on a seasonal basis, so check on the times before going. 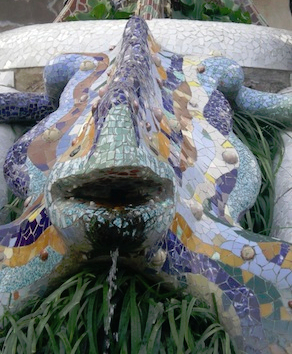 Park Guell – This wonderfully whimsical fairytale land is another masterpiece of Catalan architecht Antoni Gaudi. Park Guell sits on top of El Carmel Hill and offers breathtaking views of Barcelona and is full of colorful structures with fascinating shapes and designs such as the dragon fountain found at the entrance and Hansel and Gretel Houses. L’Aquarium – The largest aquarium dealing with Mediterranean marine life boasts 35 aquariums with 11,000 animals and more than 450 species. L’Aquarium also has the “Oceanarium”, a 260 foot long underwater glass tunnel where you can see sharks and other marine swimming, giving you the feeling of being in the sea with them. For more information on things to do in Barcelona go to www.barcelonaturisme.com. 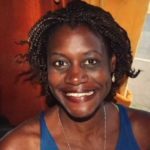 Monique is a native Californian who has spent the last decade living in Europe and is using it as a launch pad to travel the globe with her family. Disclosure: The Barcelona Tourism Office provided me with a City Card, which granted us access to many of the activities listed above.